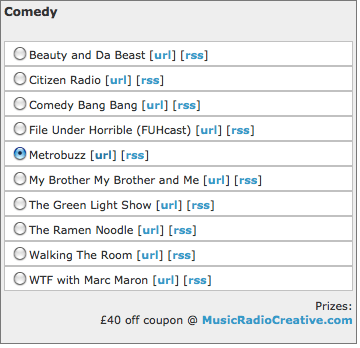 MetroBuzz has been nominated for a podcast award in the category “Best Comedy.” We are going up against some very fierce competition, but you can vote once daily from Nov. 1 through Nov. 15, so if you have a minute each day and want to throw a vote our way at any time(s) during the voting period, that would be very much appreciated. It’s very easy – just go to http://www.podcastawards.com/ and down to the Best Comedy section and select “MetroBuzz.” Don’t look at the other nominees in our category! 😉 Just vote for us, hehe. This entry was posted in John Norton, Metrobuzz and tagged Metrobuzz, Podcast, Podcast Awards. Bookmark the permalink.